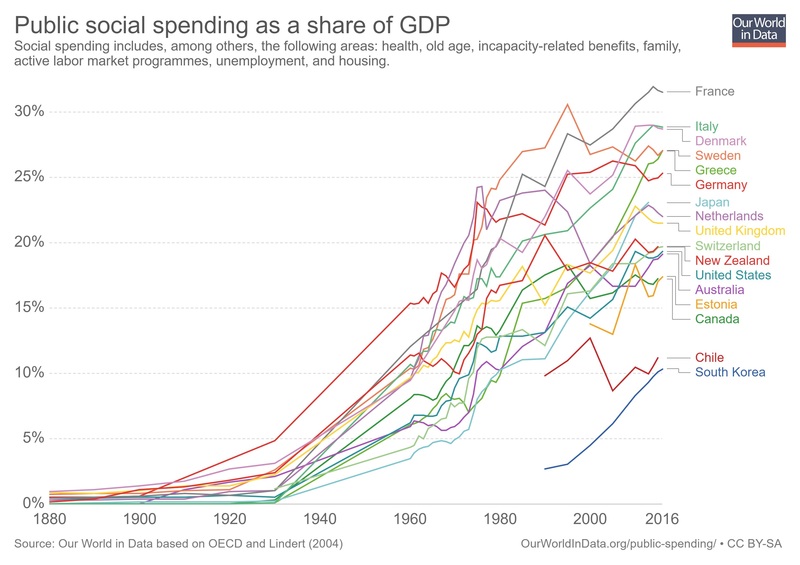 The long-run fiscal outlook for most developed nations is very grim thanks to demographic change and poorly designed entitlement programs. For all intents and purposes, we’re all destined to become Greece according to long-run projections from the International Monetary Fund, Bank for International Settlements, and Organization for Economic Cooperation and Development. Are there any solutions to this “most predictable crisis“? Politicians such as Alexandria Ocasio-Cortez and Bernie Sanders would like us to believe the answer involves never-ending tax increases. 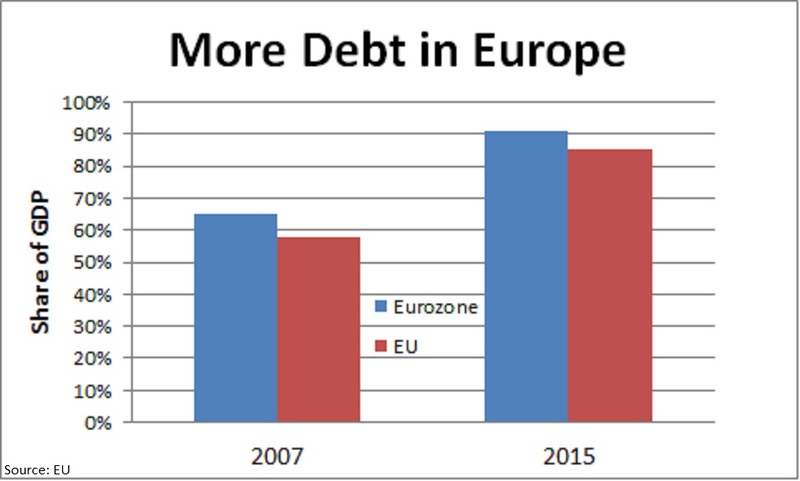 But such an approach is a recipe for more debt because the economy will weaken and governments will spend more money (look at what’s been happening in Europe, for instance). A more sensible approach is a spending cap. I’ve pointed out, for instance, how Swiss government debt has plummeted ever since voters imposed annual limits on budgetary growth. We also can learn lessons from history according to new research from the International Monetary Fund. The report contains some very interesting economic history and the evolution of government finance, including the Bank of England being created and given a monopoly so the government would have a vehicle for borrowing money (as I observed in my video on central banking). 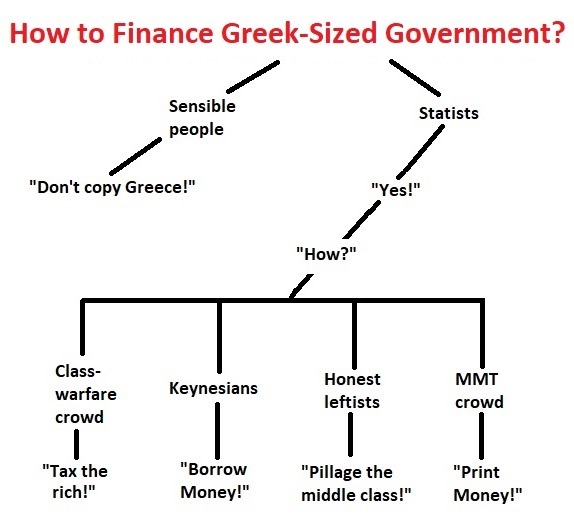 But it mostly tells the story of how governments and public finance simultaneously evolved. Although the written record points to instances of public borrowing as long as two thousand years ago, recent scholarship points to 1000-1400 A.D. as when borrowing agreements with states were concluded with regularity and debt contracts entered into by sovereigns were standardized. …The supply of loans from city-states and territorial monarchies was driven by the need to finance military campaigns and secure borders. …From the 16th century, Europe’s political geography coalesced into the nation states recognized at the Peace of Westphalia in 1648. In parallel, many European states evolved from absolutist regimes to more limited government. …Fiscal states thus evolved in response to the efforts of rulers to secure borders, expand territory and survive. After 1650, larger, more centralized states increasingly possessed the fiscal machinery to raise revenue in uniform ways and had a veto player, such as a parliament, to monitor and discipline public expenditure. 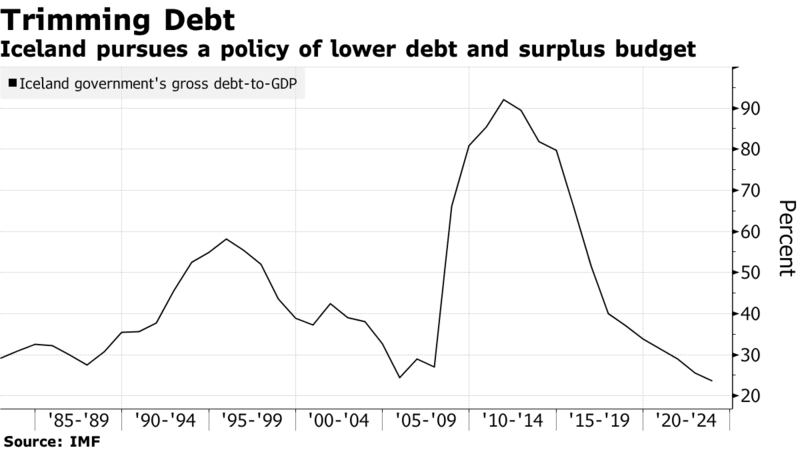 There’s also lots of information in the report about how some governments, primarily outside of Europe, began to borrow money. But the part of the report that caught my eye was the description of how three advanced nations – the United Kingdom, the United States, and France – successfully dealt with large debt burdens before World War I. …we describe three notable debt consolidation episodes before World War I: Great Britain after the Napoleonic Wars, the United States in the last third of the 19th century, and France in the decades leading up to 1913. While the colorful debt crises and defaults of the first era of globalization have been much discussed, less attention has been paid to these successful consolidation episodes. 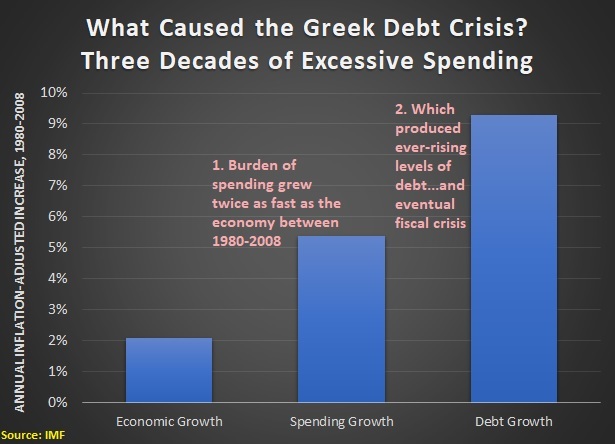 We focus on these three cases because they involved three of the largest economies of the period, but also because their debt burdens were among the heaviest. 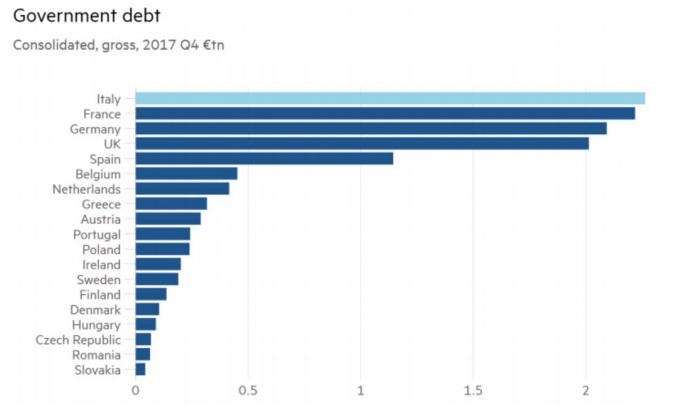 British public debt as a share of GDP was higher in the aftermath of the Napoleonic Wars, for example, than Greek public debt in 2018. But in all three cases, high public debts were successfully reduced relative to GDP. In each case, war-time spending was the cause of the debt buildup. The Napoleonic Wars, Franco-Prussian War and U.S. Civil War were the three most expensive conflicts of the 19th century. …debt accounted for the single largest share of wartime financing. Here’s a table showing that these nations dramatically reduced their debt burdens. To be sure, there were differences in the three nations. The reduction in the British debt-GDP ratio was by far the largest and longest: the debt ratio fell from 194 percent in 1822 to 28 percent nine decades later. …The French public-debt-GDP ratio fell from 96 percent in 1896 to 51 percent in 1913… This case ranks second in size but first in pace. U.S. (federal or union) government debt was not as high at the end of the Civil War, and the subsequent consolidation was more leisurely; however, the process is notable for having reduced the debt-GDP ratio to virtually zero by World War I. When the authors investigated how these nations reduced their debt burdens, they found that limited government was a common answer. This was true in the United Kingdom. It was true in the United States. In the U.S., primary surpluses were consistently achieved… Southern states opposed an expansive role for the federal government, while entitlements limited to Civil War pensions contained pressure for public spending. And it was true even in France. In France, debt reduction was entirely accounted for by primary surpluses. Those surpluses exceeded British levels, reaching 2.5 percent of GDP on average, albeit over a shorter period. Remember, this was a period when total government spending only consumed about 10 percent of economic output. And this was a period when there was no welfare state. Redistribution was virtually nonexistent. Not even in France. So it shouldn’t be a surprise that debt quickly fell in all three countries. The common thread was small government. …in all three of these large-scale debt consolidations, governments and societies went to great lengths to service and repay heavy debts. …it reflected prevailing conceptions of the limited functions of government, and limited popular pressure for public programs, entitlements and transfers. What’s equally important is to note what didn’t happen. No default. No inflation. No indirect confiscation. …there was no restructuring or renegotiation of official or privately-held debts in these cases. 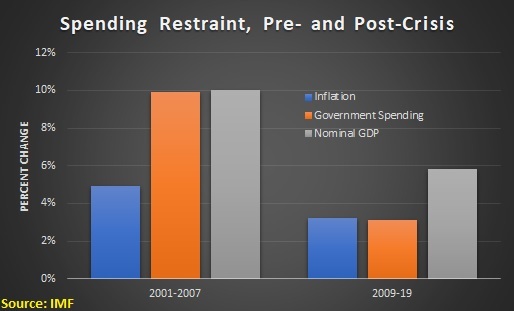 Nor was there financial repression, i.e., measures artificially depressing interest rates. …Governments for their part did little to bottle up savings at home or to otherwise use regulation and legislation to artificially depress yields. …None of these three governments undertook involuntary restructurings despite the inheritance of heavy debt. The authors point out how debt is rising today because of the welfare state rather than war. 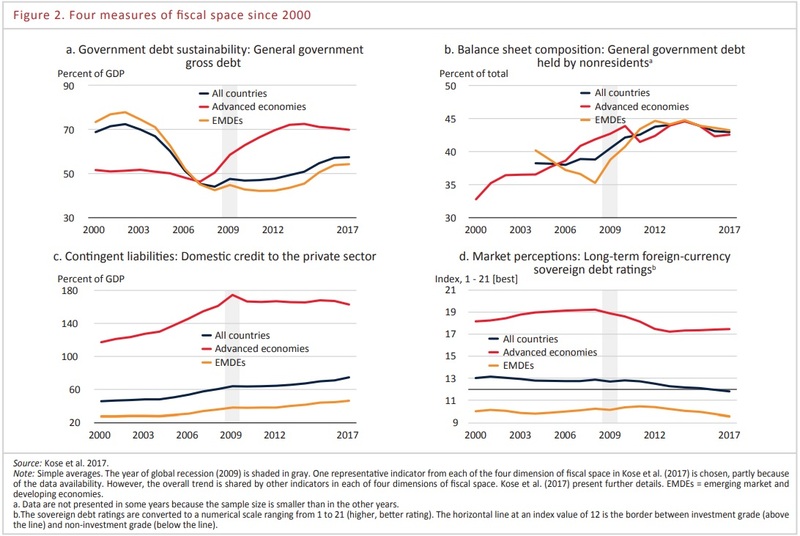 The end of the last century also saw, for the first time, a secular increase in public-debt-to-GDP ratios in a variety of countries in conjunction not with wars and crises but in response to popular demands on governments for pensions, health care, and other often unfunded social services. Given the demographic changes I mentioned at the beginning of the column, this does not bode well. So what are the likely implications? As the authors note, there are two ways of dealing with high debt levels. Countries have pursued two broad approaches to debt reduction. The orthodox approach relies on growth, primary surpluses, and the privatization of government assets. In turn this encourages long debt duration and non-resident holdings. Heterodox approaches, in contrast, include restructuring debt contracts, generating inflation, taxing wealth and repressing private finance. At the risk of understatement, I fear Robert Higgs is right and that today’s politicians (and today’s voters!) will choose the latter approach. Given that those policies will make a bad situation even worse, I’m not overflowing with confidence about the future.